Clients may choose from five shades and should expect their tanning session to take about 20 minutes, which includes drying . Allergic to the sun but addicted to tanning.We are able to custom tailor colors to match your skin tome and maintain a natural color. Gone are the orange tones associated with the products of old. In addition to DHA, most products contain an immediate bronzer. The formulation of the bronzer determines the initial color of your skin after application. This is where most products miss the mark. If you don’t like the color of your skin after you have applied the product it is because the bronzer has poor coloration. The initial color will only last until you take your first shower after it is initially applied. The color that remains is produced by the DHA reacting with your skin. DHA will always produce the same results based on concentration and application levels. Bronzers were designed by consulting with professional makeup artists and can be custom blended to the initial color you desire. In addition, you also have the choice of twelve delightful fragrances to choose from. Want more? Check out Studio 88 on Facebook. Limit 2 per person, may buy 1 additional as gift. Limit 1 per visit. By appointment only: Please call 973-778-8880 to book your appointment. Please tip on original amount. 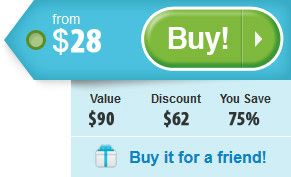 Promotional value expires 90days from purchase date. No cash value / No cash back.